SPW035738 SCOTLAND (1931). 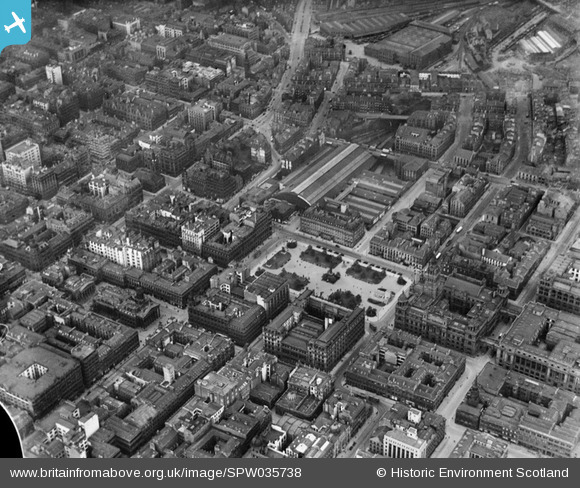 Glasgow, general view, showing George Square and West Nile Street. An oblique aerial photograph taken facing north. Title [SPW035738] Glasgow, general view, showing George Square and West Nile Street. An oblique aerial photograph taken facing north. North British Station Hotel on the north side of George Square, in about 1906. The building was erected 1807-1818 and was known as the Queen's Hotel when it was acquired by the North British Railway Co in 1903. The attic was converted 1903-1905 to form a top storey, clearly visible here. Part of the railway company's adjacent Queen Street Station is on the far left of this photograph. British Rail sold the building in the 1980s when it became the Copthorne Hotel. In 1986 a conservatory was added to the front of the building, facing the square.